Fun… Cute?… with plenty of room for creative use of effects! I downloaded the motion and WAV file from CromaticKitten’s link. If you search YouTube, you will see versions that are about a minute long, like this one… and other videos that are over two-minutes long. Those longer ones contain the second verse of the song. I unzipped the RAR using BandiZip and read the READ ME file. 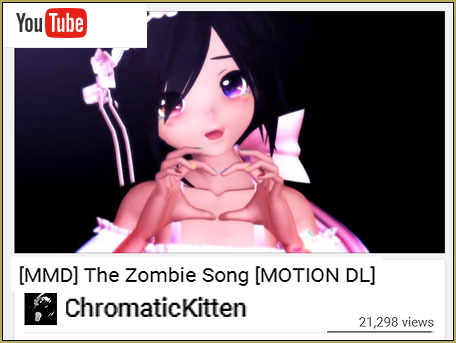 ChromaticKitten gives us permission to modify the motion as needed to suit our models and asks that we give her the credit for the motion… “done” and “done”. I noticed in that download folder that there are TWO motion files… on specifically for TDA models… so that gave me the hint to USE a TDA model… and I chose my Tda Akita Neru one-piece v4.00C.pmx. 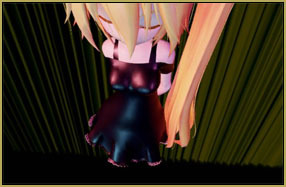 This animation should be kind of spooky… and Neru in that black dress did it for me. I see that many MMDers have used Yandere models with zombie attributes… that’d be awesome! The motions are sweet and they fit my Neru, just fine… except that when it came time for her to form her two hands into the “heart” shape, the finger tips did not come together. I went into the motions and adjusted the wrists, left and right, to bring the fingers into that heart shape… STILL not as nice as in ChromaticKitten’s animation… but pretty nice. In the ReadMe, ChromaticKitten warns us that her camera motion file was made to work with shorter models, like the one she used… and we may need to modify the motion to suit our model… and so it was. I made several fine adjustments to suit my Neru model. The second camera move I changed completely; from a pan up the side of Neru’s hip into an Overhead shot with a distorted camera view… done so as to hide the fact that my Neru model has some kind of a collision conflict causing a portion of her skirt to be constantly in a rattling motion. I couldn’t fix the motion, so I changed the camera’s view. I chose to add RAYCAST because of the look of skin and flesh… and I like the way Neru’s dress and hair-ribbon became “gloss black leather” under that effect. 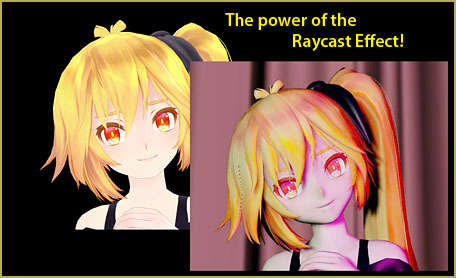 Raycast let me light my model with colored light, different left and right… and lit from slightly below so that colored shadows fall upon Neru’s form. I also added one of my favorite effects, SvDOF for control of the focus… especially during the final few seconds when I fade to soft-focus, blurry black. I have a little over two hours into my version of this animation… and… as you know… could spend hours, more, tweaking every little thing. I hope YOU will give it a try… have some fun… experiment with stages and effects. If I were a zombie, I’d never eat your brain. I just want your heart; yeah I want your heart, just want your heart. 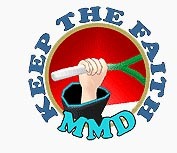 Question, how do I actually start an MMD model? None of the mechanics I used on my old computer work with my new one. Do you mean “how to MAKE a model”?